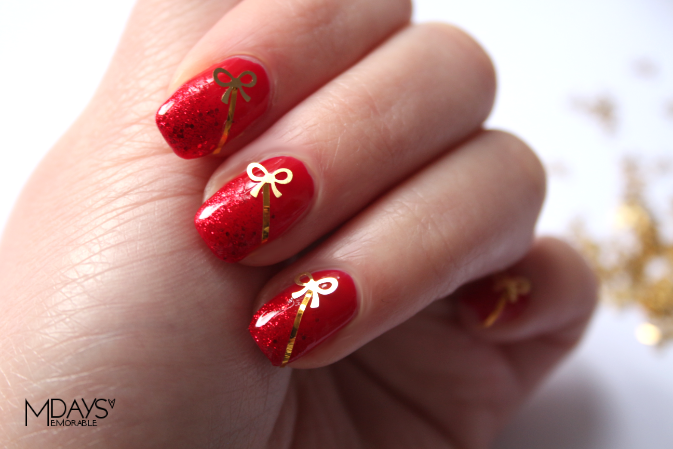 Tutorial: Chinese New Year Nails with Bowknot Stickers | Memorable Days : Beauty Blog - Korean Beauty, European, American Product Reviews. 新年快樂! 恭喜发财! Happy Chinese New Year Everybody ^o^ and Happy Seollal to the Koreans! This holiday is just another excuse to consume a lot of yummy food and for the kids and young people to receive a lot of red envelopes kekeke. I hope you will have a lovely, healthy and joyful Chinese New Year ^^, the year of the Snake! Today I would like to show you a tutorial of my Chinese new year mani which I've created with foil stickers from Bornprettystore.com. STEP 1 : Apply a base coat and let it dry. STEP 2 : Apply a red nail polish and let it medium dry. 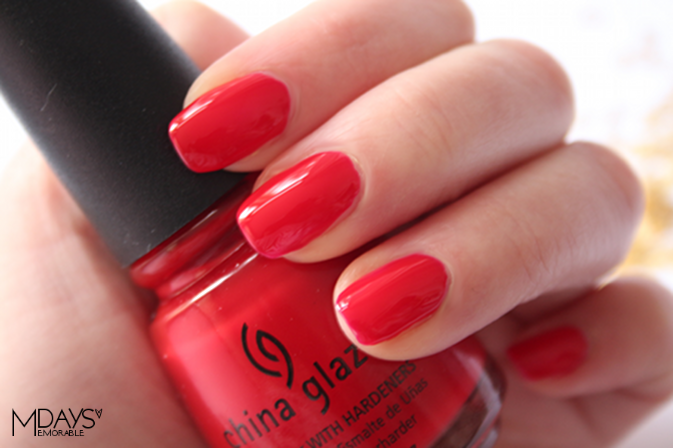 I'm using China Glaze - Winter Berry. STEP 3 : While the red nail polish is slightly dry. Apply a red glitter nail polish diagonally on the tips of your nails and stop at the black stripe which i drew in the picture below. I'm using the Ring in the red nail polish from China Glaze. STEP 4 : While the nail polish is still wet, use a bowknot sticker. 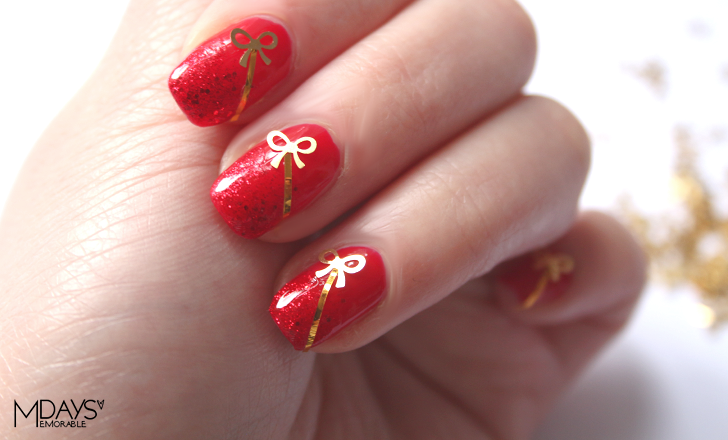 I am using bow stickers from Bornprettystore (link to the product), it's called Foil Metal Nail Art Tips Stickers on their website. You can purchase a bag which includes 1000 bow stickers for $8,80. It doesn't stick on its own, so you do need to apply it while your nail polish is still wet. If your nail polish is already dry, you can apply a top coat and add the stickers afterwards. Feel free to use my coupon code: MDJ61 to get 10% OFF! I do need to point out that the stickers will go off easily since the sides are sticking out, so be careful when you have them on your nails. STEP 5 : Apply a golden striping tape diagonally, just like in the picture below. I've reviewed these striping tape before which I got from Bornprettystore.com (link to the product), feel free to visit the review if you are interested, link to the blogpost. 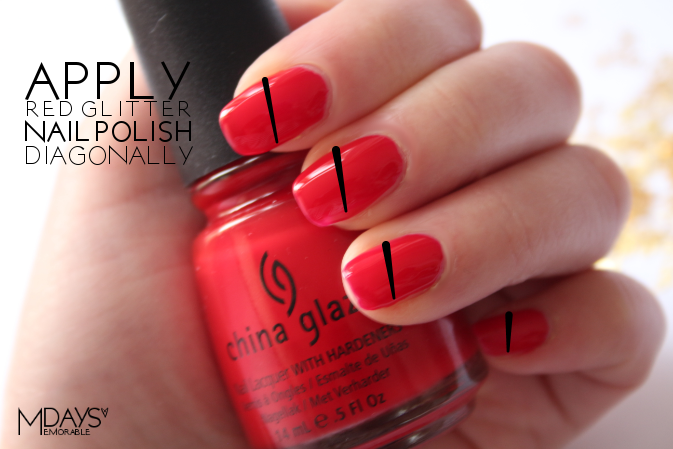 This completes the look of my Chinese New Year mani! Leave a comment below if you liked it. If you are going to recreate this mani, please let me know through my Facebook, Twitter or Instagram.